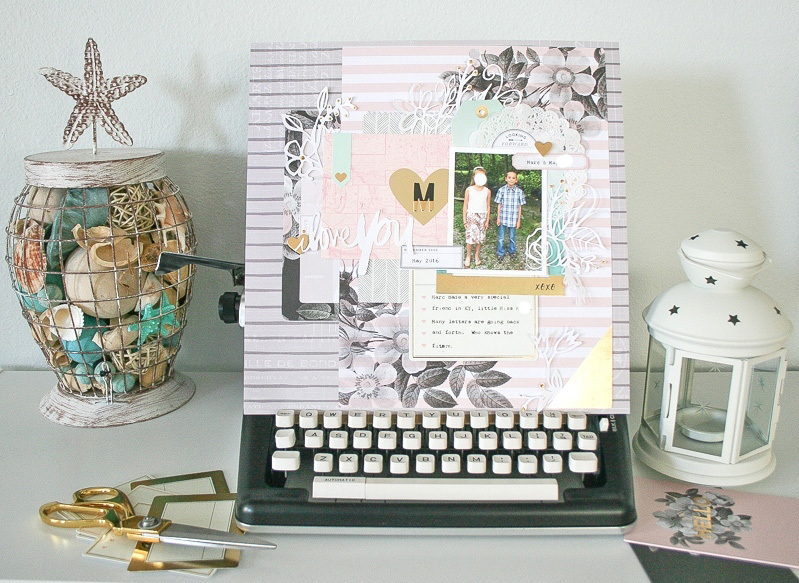 Hello everyone, Wendy here today to share a sweet layout of my little boy using the new Typecast collection and the super fun Typewriters! I have wanted a typewriter for so long now to allow me to add journaling anywhere and now We R Memory Keepers has made just that, and in pink too. 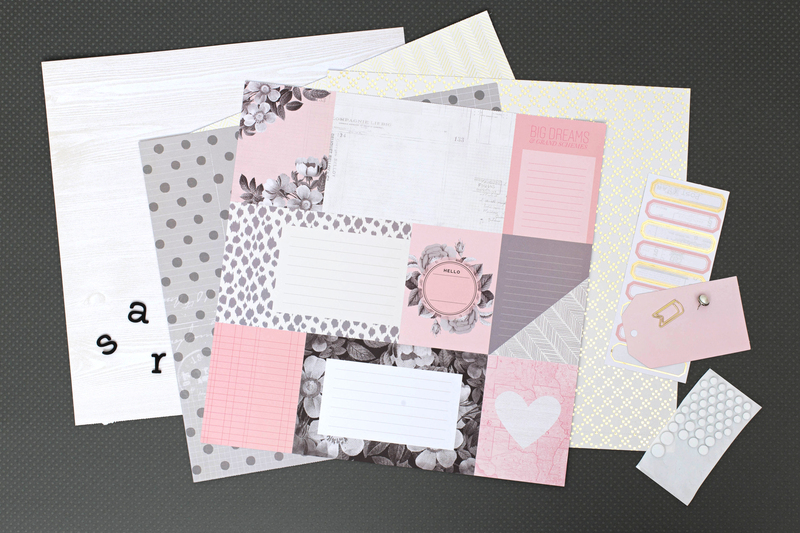 As I began paging through the Typecast paper pad, I was drawn to the gray and pink pages with the flowers. I chose an 8.5×11 page to add to my 12×12 page to add some interest through color and the florals. 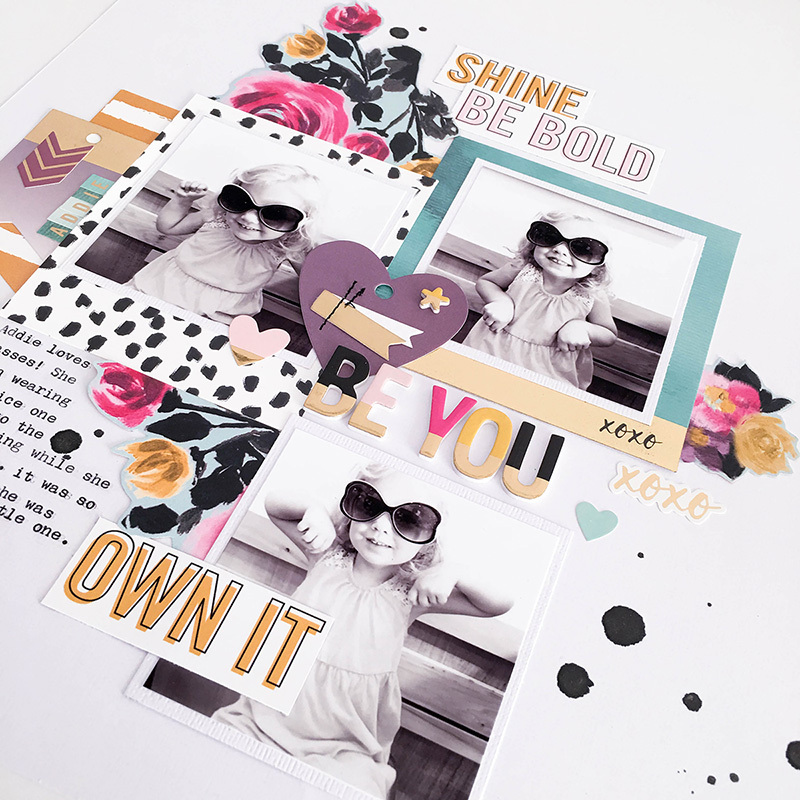 Using a postcard, desk pad, and bag from the Typecast collection allowed me to further add in color and textures to keep a calm layout, but elegant. The addition of a doily and some white floral cut files from Wilna Furstenberg were the perfect touch to add to the sweetness of young love. 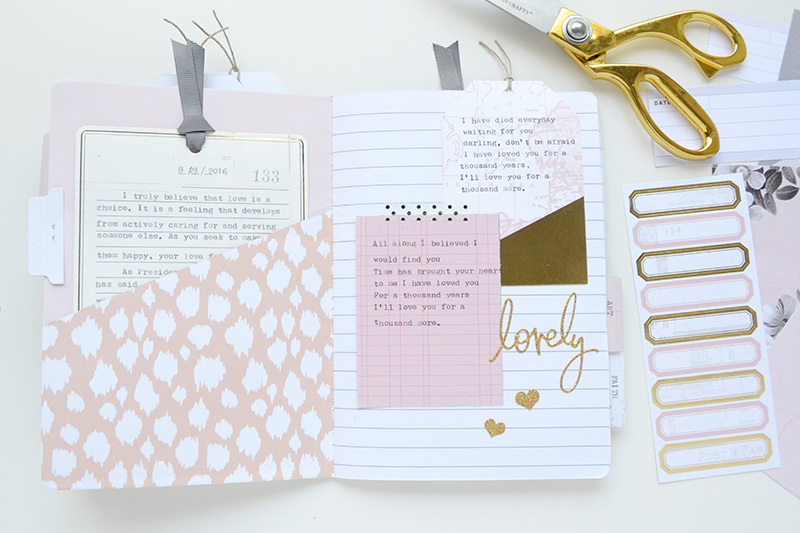 After establishing the main pieces of my page, I grabbed a journaling card to add some of the details to the page. 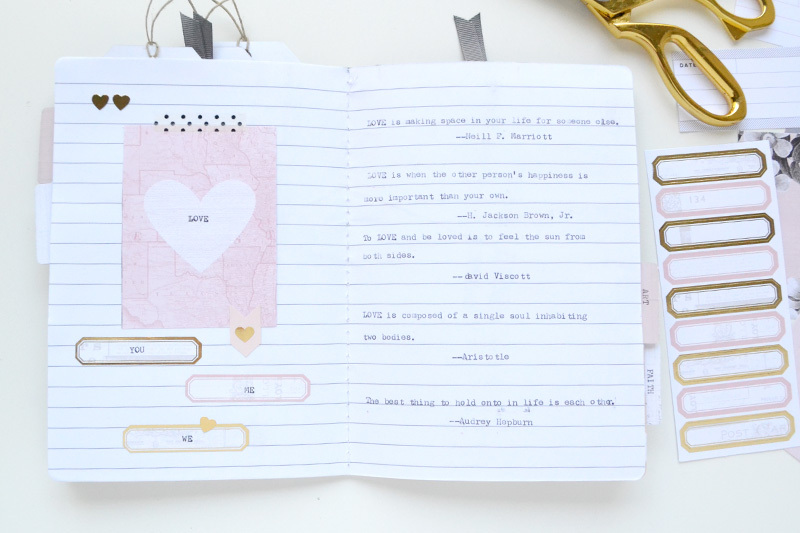 I love how easy it was to add typed journaling to my page without the hassle or running the pieces through my computer as I used to have to do. 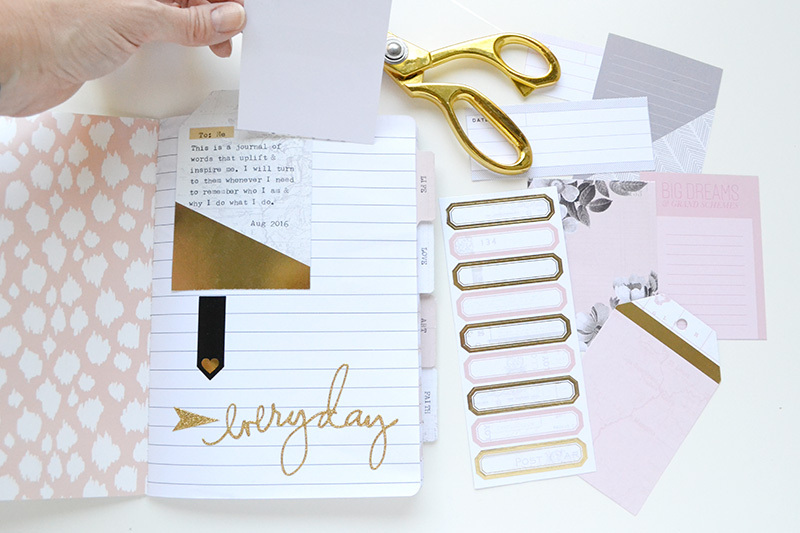 I can’t wait to try this in my planner and my Project Life page too as it is so convenient. 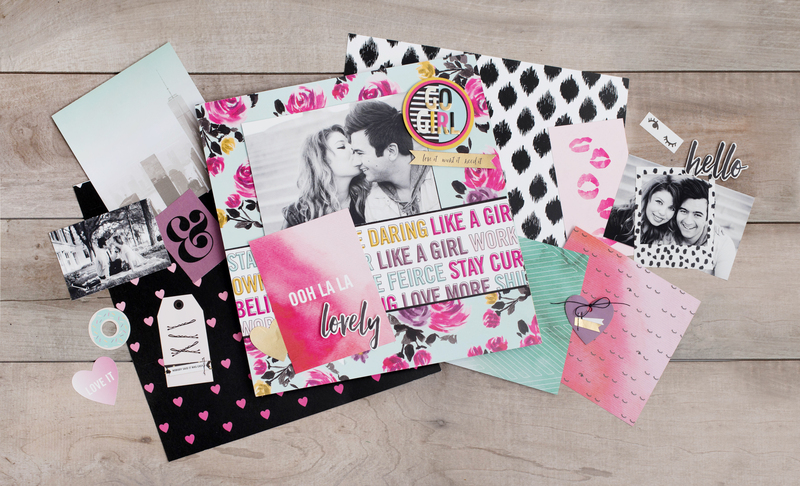 The Urban Chic ephemera and Thickers worked really well with the Typecast collection, they added just the right amount of color and details. Design Tip: Simple design layouts don’t mean that you can’t add layers for texture and elegance, and by choosing white elements such as doilies and cut files you can easily add to the layout without taking away from the simple elegant style. This layout will be a treasure in my little boy’s book and who knows what the future might hold for these two! With the WRMK typewriter in your hands, there are no more excuses for not getting the story written down and in your books. Hi friends! 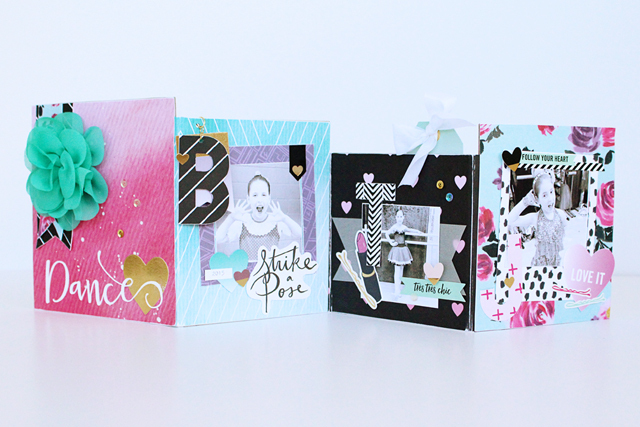 It’s Aly Dosdall here to share a fun Typecast project since this week is Typecast Week! Our designers have come up with some very cool projects to inspire you, and I can’t wait for you to see them. 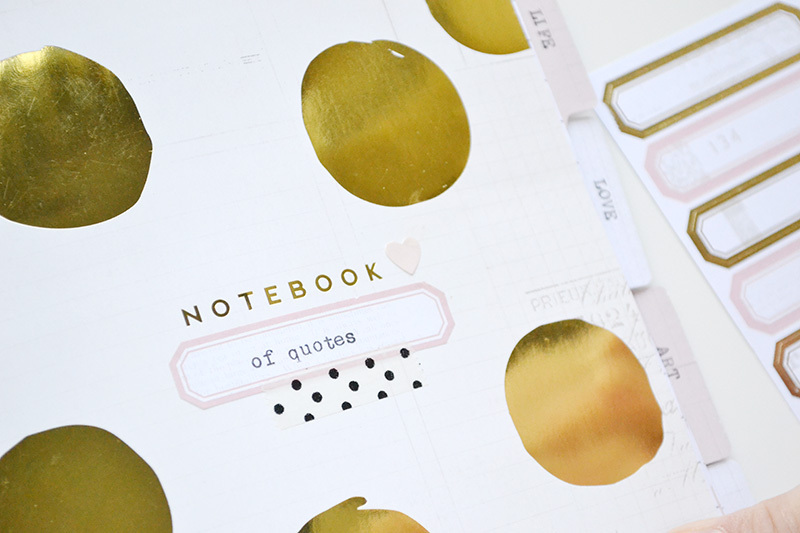 But, first off take a peek at my Typecast Quote Journal! As I’ve gotten older I’ve discovered how much words, ideas, and thoughts can affect you. If you fill your mind and life with positive words, ideas, and thoughts it can totally change you. 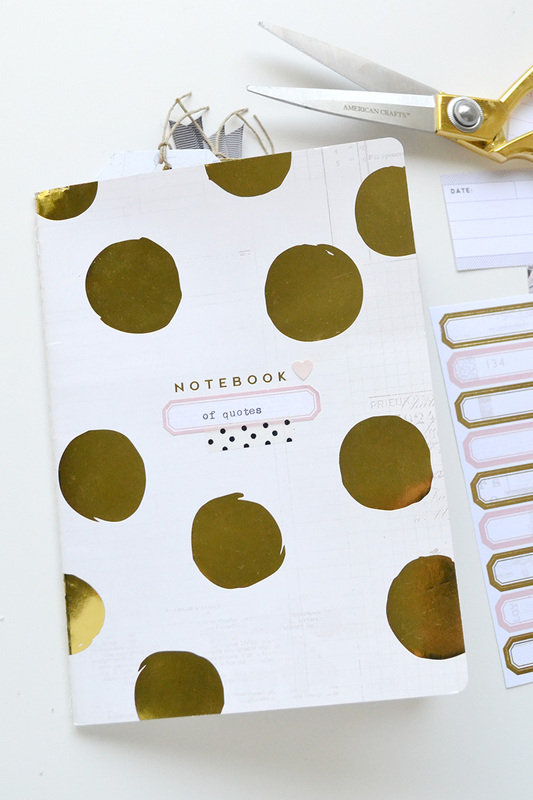 For a while I’ve been wanting to start a quote journal, and when I got my new Typecast Typewriter and saw the lovely gold polka dot notebook, I knew it was time to make one! One of my life philosophies is simplicity. I like to find ways to simplify my life and my projects. So I kept this project pretty simple and the typewriter helped a TON with that! 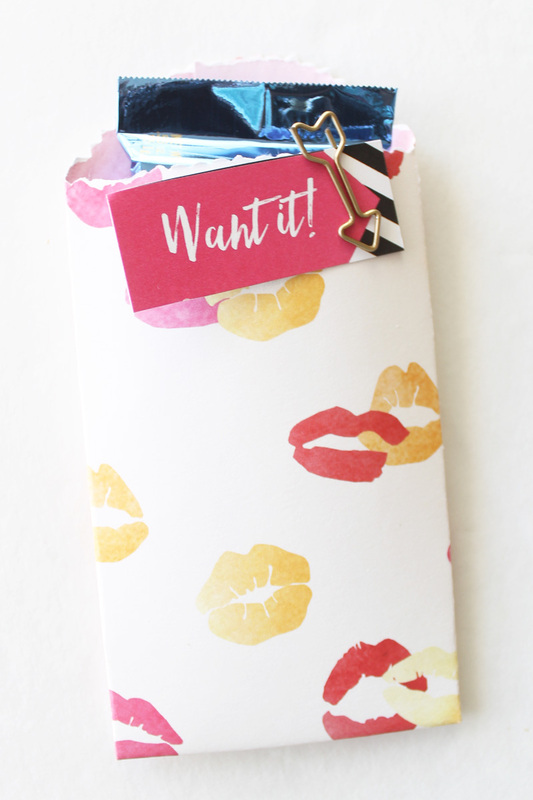 I added a label from the Typecast collection to the cover, along with a small pink heart sticker from the Urban Chic collection (that goes perfectly with the Typecast collection) and a little bit of washi tape from my Rhino Washi Tape Dispenser. I divided my journal into four subjects: Life, Love, Art, and Faith, and I’ll be collecting my favorite quotes about these four key parts of my life. 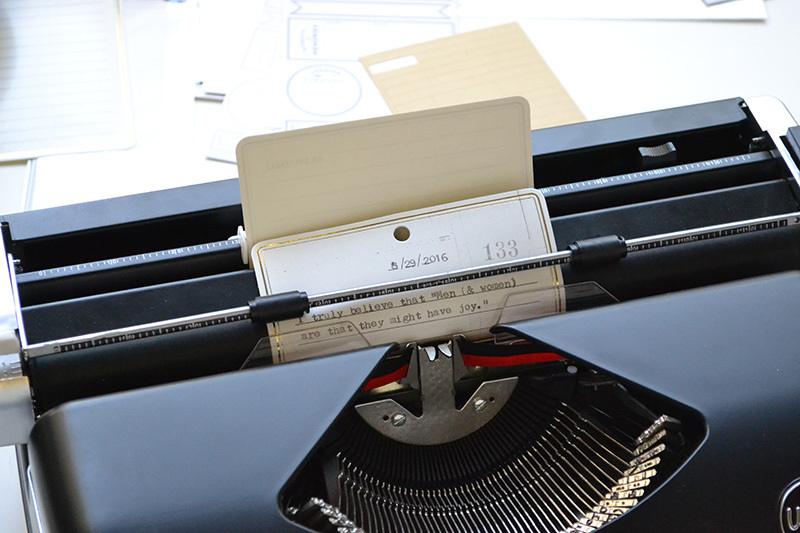 It was easy to add some custom tab dividers to my journal with the Tab Punch and typewriter. This is my title page which briefly explains the purpose of this journal and my goals about using it. I attached a journaling card over my journaling with washi tape to create an interactive element. The first page in each section of my journaling is sort of a declaration of my foundational philosophy about that aspect of my life. 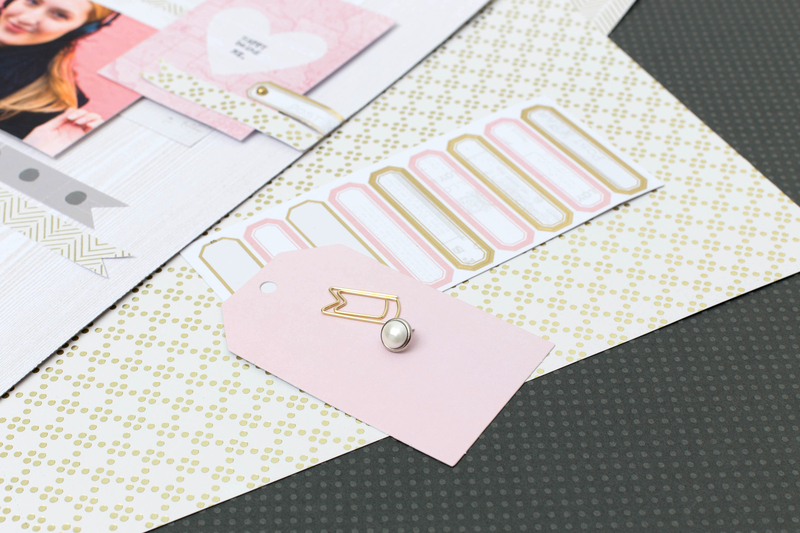 I included some additional embellishments from the Urban Chic collection and some Heidi Swapp Memory Planner stickers. 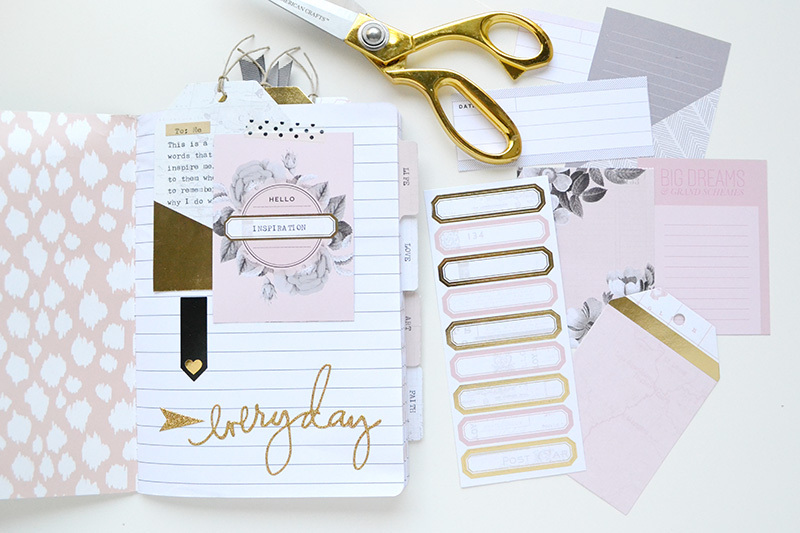 The beginning of each section is marked with a pocket page that has a removable insert. I typed some thoughts and ideas on each of those as well. Then each section includes a few blank lined pages where I will add my favorite quotes about each of the four topics. 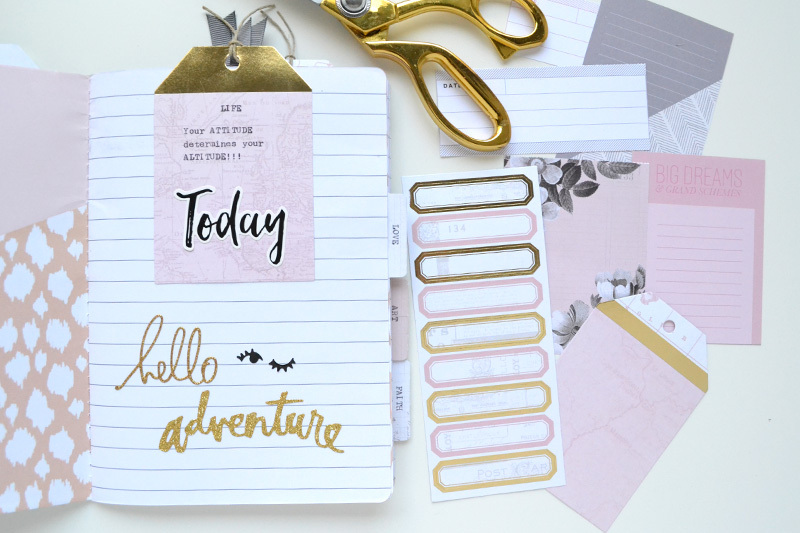 I love all the little labels, tags, and other bits included in the Typecast collection. 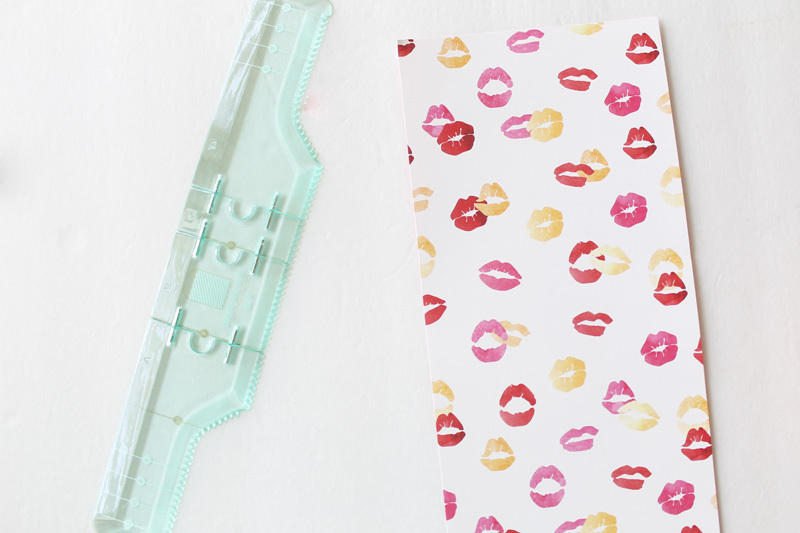 They’re perfect for creative journals, planners, and other projects! I’m so excited about this quote journal. I look forward to adding more to it, and to browsing through it when I need a little sunshine and positivity in my life. Good Monday morning friends! We love to greet the week with exciting news, and that’s what we’re doing today. 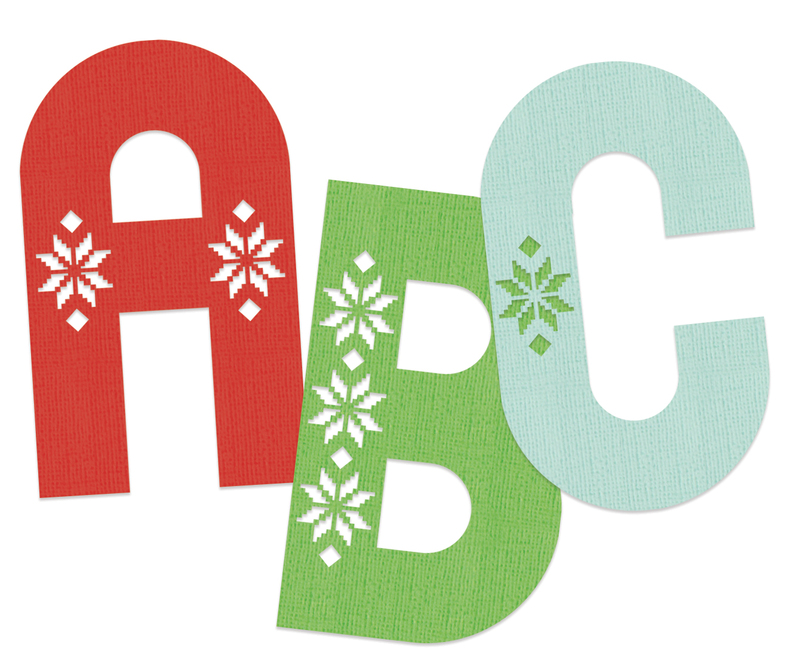 We’re so happy to introduce you to our latest new release, the Holiday Font Punches! 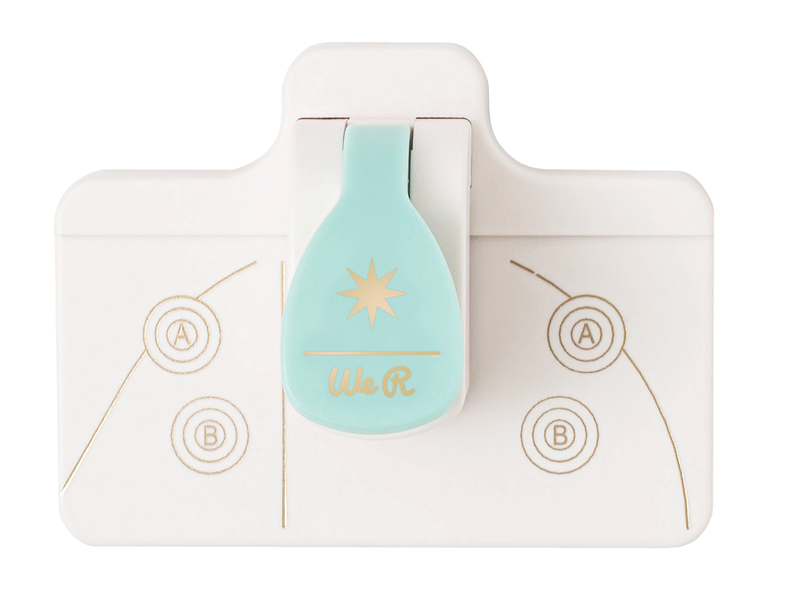 These punches come in several designs that can be combined together on your Alphabet Punch Board holiday projects to create custom decorative fonts. 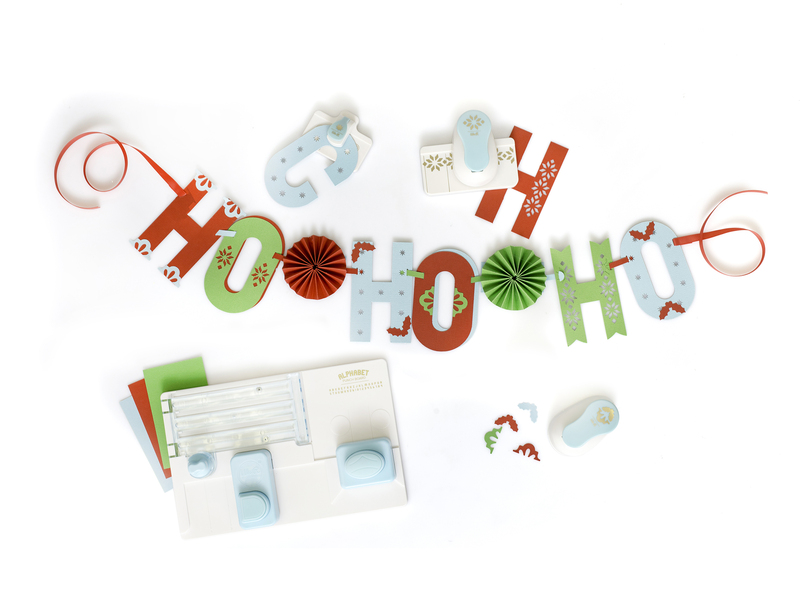 Choose from the Serif Punch, the Decorative Punch, or the Marquee Punch–all with holiday themes. 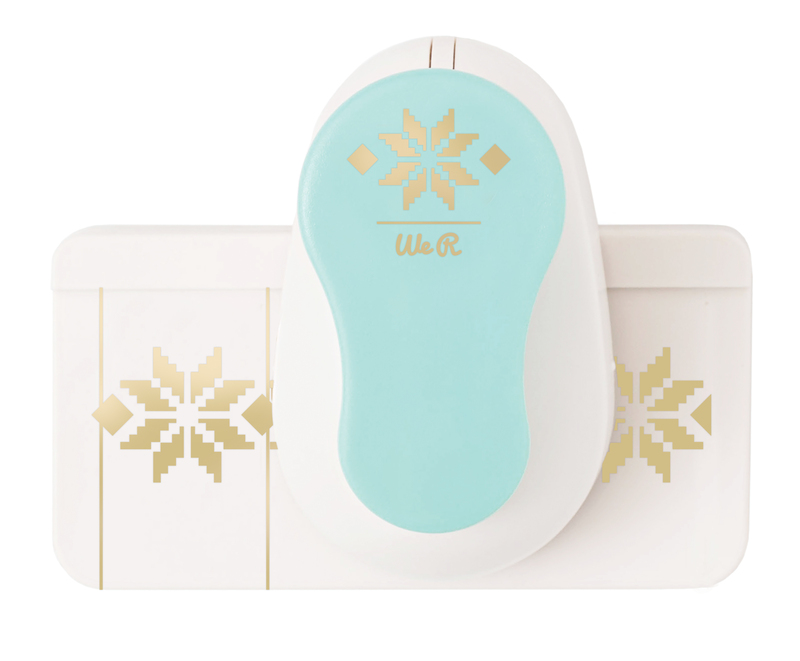 These punches are just now releasing to retailers, so watch for them in stores and online in the coming weeks! So gorgeous! I see lots of happy mail – flip books and such – in my future with this collection! Congratulations Natalie! Please send an email to wrsocial@americancrafts.com with “Urban Chic Winner” in the subject line. Include your full name and shipping address, and we’ll send you your prize asap. We hope you all have a wonderful weekend, and happy crafting! Hello We R Memory Keepers Fans! 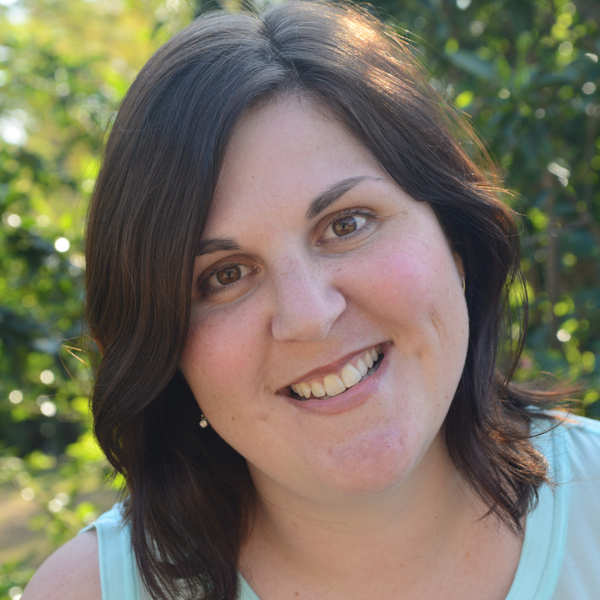 My name is Gail and I’m from Brisbane, Australia! I’m a busy mum to 3 young kids ages 8, 5 and 2 and in between all the daily mummy duties such as making sandwiches, never-ending laundry and driving to school and kindergarten, I try to make time to do something creative every day! 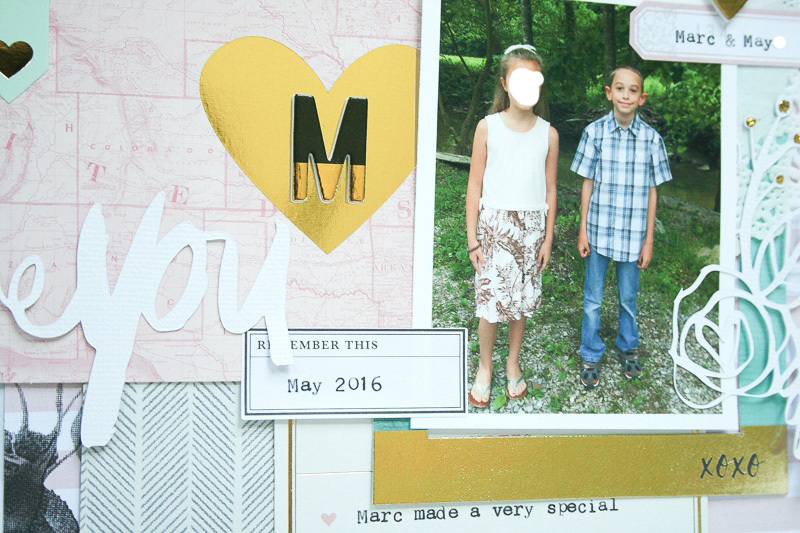 I’m truly passionate about memory keeping and have been scrapbooking for 16+ years. You’ll find me regularly sharing my creative work on the American Crafts, Pink Paislee and Bella Blvd design team blogs. Favorite We R Product: 1-2-3 Punch Board! Such a versatile tool! 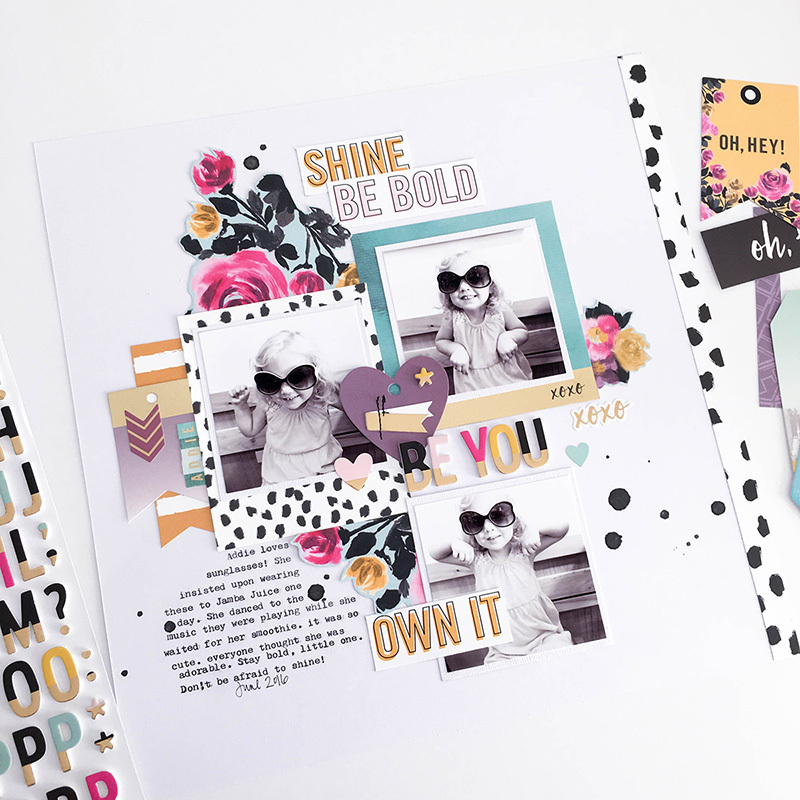 I’m so excited to be a guest designer on the blog today and share a couple of projects I created using the Urban Chic collection! I was so happy to work with this collection! Including some of my fave colors: pink, teal, black and white and don’t forget GOLD, it was absolutely perfect for photos of my 8 year old daughter. I created a layout with photos of my daughter on her eighth birthday. Although a lot of the patterns and colors are quite bold, I pulled out a few of the softer colors to focus on. 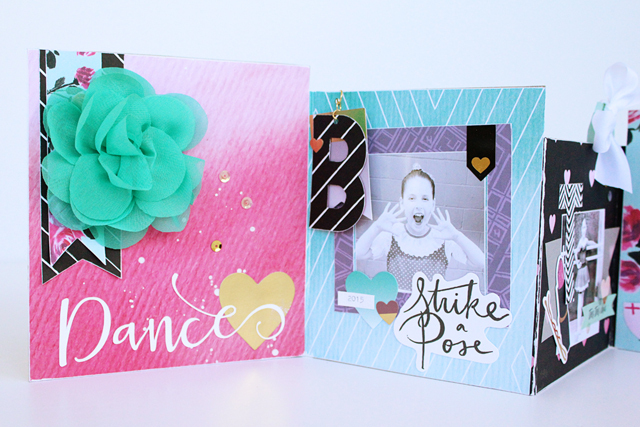 Using a white cardstock background, I added interest with layers of patterned paper down either side. As there is stitching on some of the Layered Tags, I also added stitching to my layout including a hand-stitched heart on the background, framing my photos. 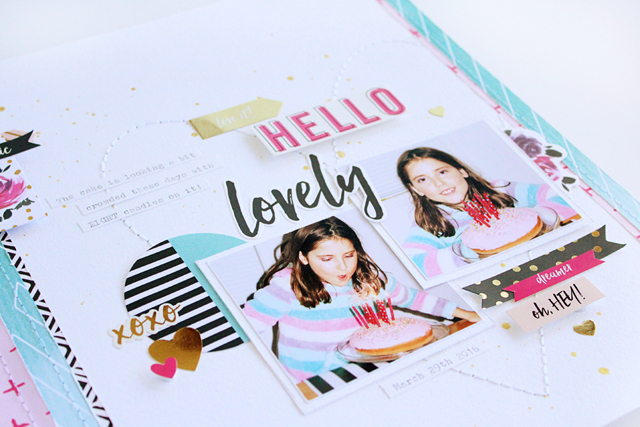 I layered up my photos with some more white cardstock, a couple of die cuts and embellished with the gorgeous stickers! A few splatters of gold mist and I love the result! For my second project, I decided to create a mini album, but I wanted it to be “freestanding” so my daughter could display it proudly on her shelf! I constructed the pages from chipboard covered in some of my favourite patterns. 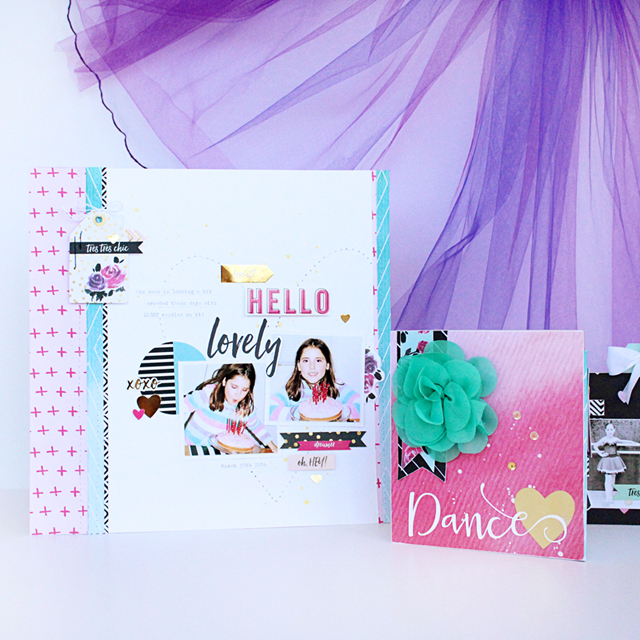 I knew I wanted this project to be dedicated to my daughter’s love of dancing so Urban Chic with all it’s very girly patterns, phrases and icons was perfect! 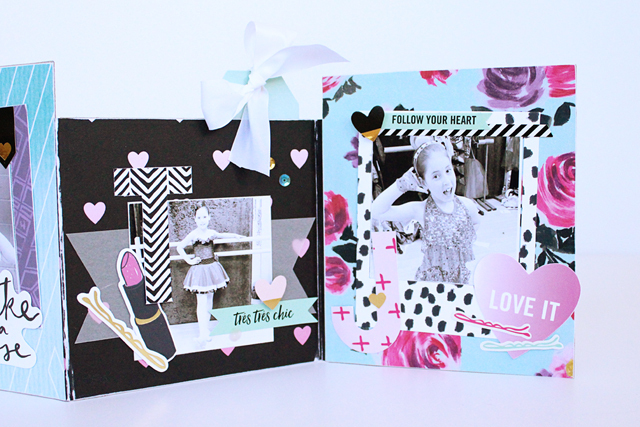 I embellished each page simply with patterned paper, stickers, frames and die cuts. I found a gorgeous teal fabric flower in my stash that I added to the front cover! On each page also, I added a letter representing the type of dance (ballet, jazz, tap) which I made using the Mini Alphabet Punch Board. 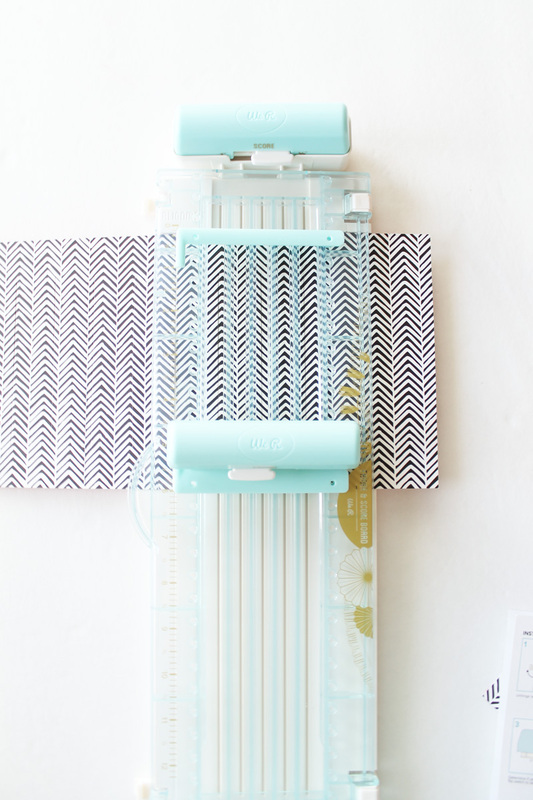 I can see so many projects in my future with the Urban Chic collection! 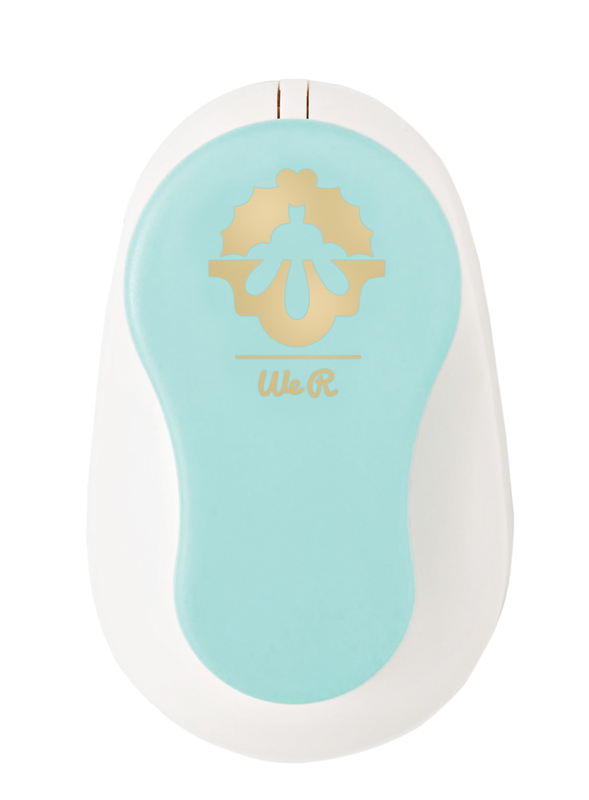 Thank you so much We R Memory Keepers for the opportunity to play with such gorgeous product! Thank you for sharing such beautiful projects with us today Gail! So glad you were able to guest design for us. We hope you all enjoy your weekend, and happy crafting! 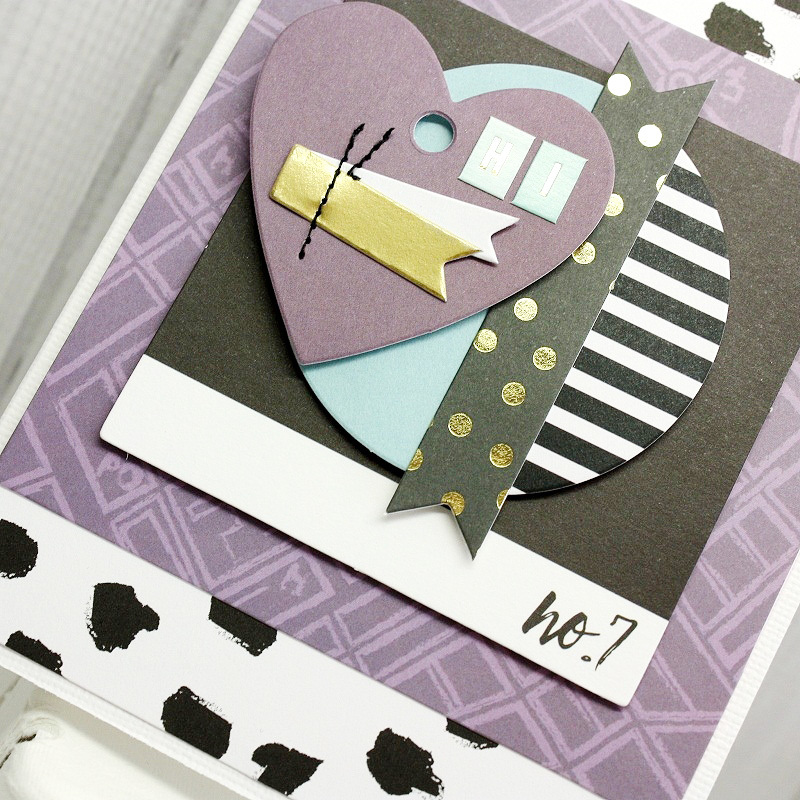 Cards are just easier to whip up when you have pre-cut shapes and square elements that layer together nicely. For this first card I started with the purple frame from the Ephemera pack and centered it onto a piece of 4”X5.25” patterned paper from the collection. Another square element was added to the center of the frame with foam adhesive. The circle and banner piece were layered together and then finally, the purple Layered Tag was attached with foam adhesive. The second card is also a combination of using a frame and then covering the opening with a larger square piece, such as this lined journal card. 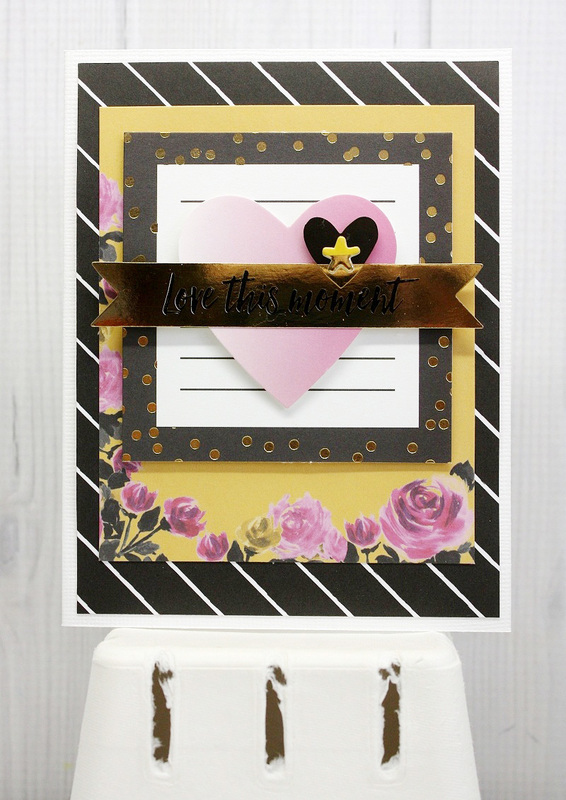 The sentiment on the pink heart was covered with the foil banner sentiment and a smaller die-cut heart was added with foam. 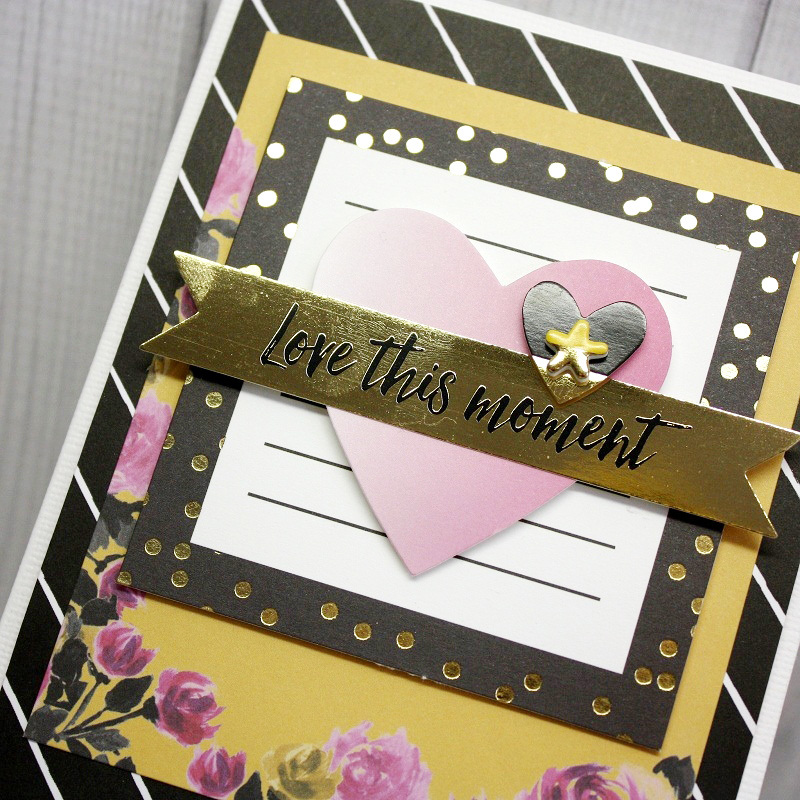 For an extra bit of fun, the foam asterisk (from the Urban Chic Thickers pack) was used to embellish the middle of the small heart. I love the color palette Urban Chic has to offer. From purple to deep yellow to aqua, hot pink to black and white, I can’t really pick a favorite. So, in order to be able to play with all the colors, I made my photos black and white. I think that just adds to the “chic” factor, anyway! I started by framing two photos with die-cut frames from the die-cut pack. Next, I fussy cut the floral pattern and tucked it in around the page. I also trimmed out phrases from another patterned paper as sub-titles. Once I had mapped out where everything would go, I circled an area in pencil for journaling and used the new Typecast typewriter for my journaling. 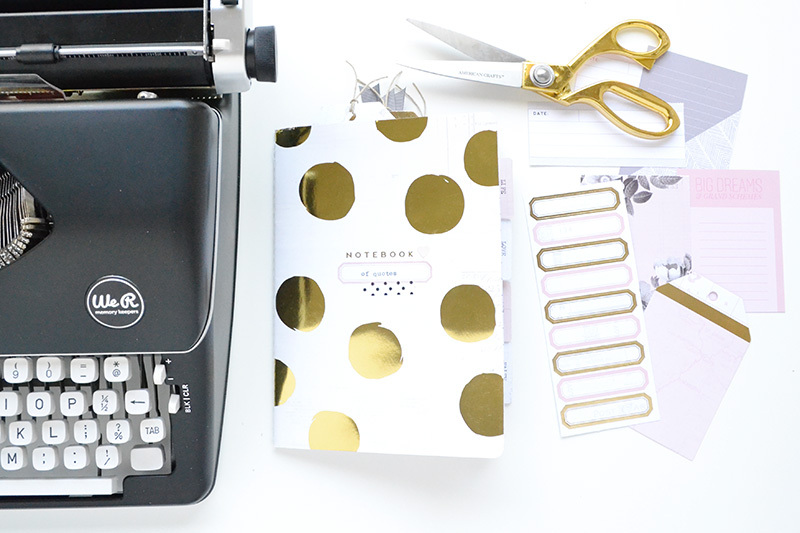 What could be more chic than using an actual typewriter directly on my layout?! After securing everything in place with adhesive, I added a few stickers, my Thickers title, and a splatter of mist for good measure. 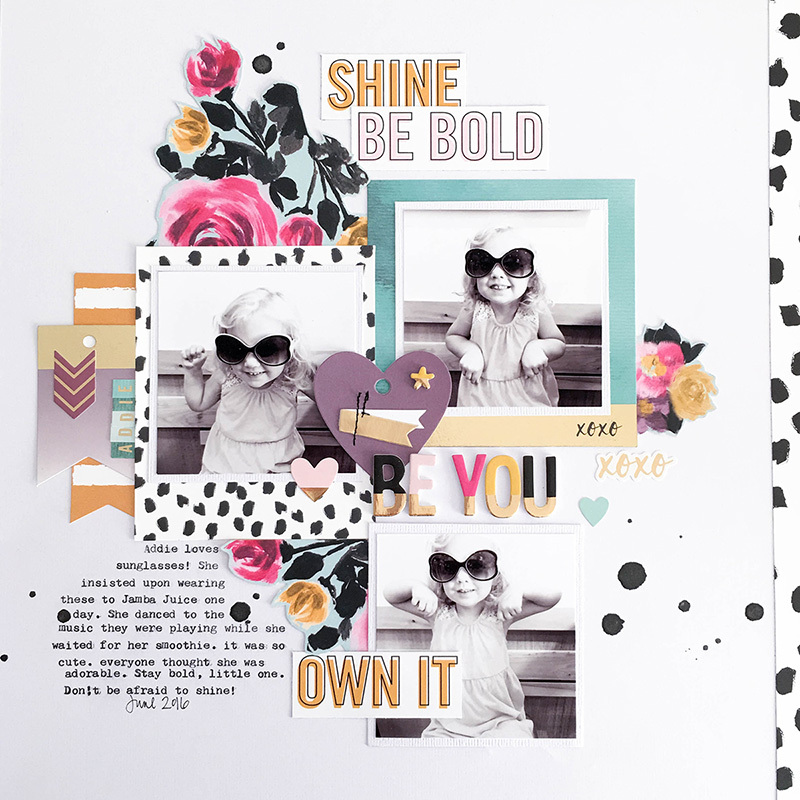 The Urban Chic collection is just perfect for showcasing my sassy little girl. I can’t wait to put it to use for a girl’s night out page, and as a dance teacher I am planning on a bobby pin-themed dance page, too! So many chic possibilities can come to life with this line. Happy scrapping! 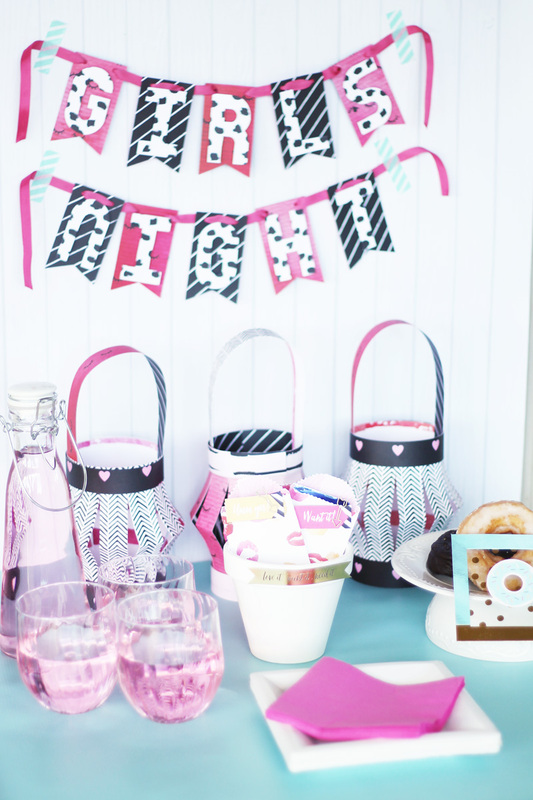 Hello We R readers, Laura here with some fun party decor ideas for you. Have you seen the new Urban Chic collection? It is beautiful, chic, and oh so fun! 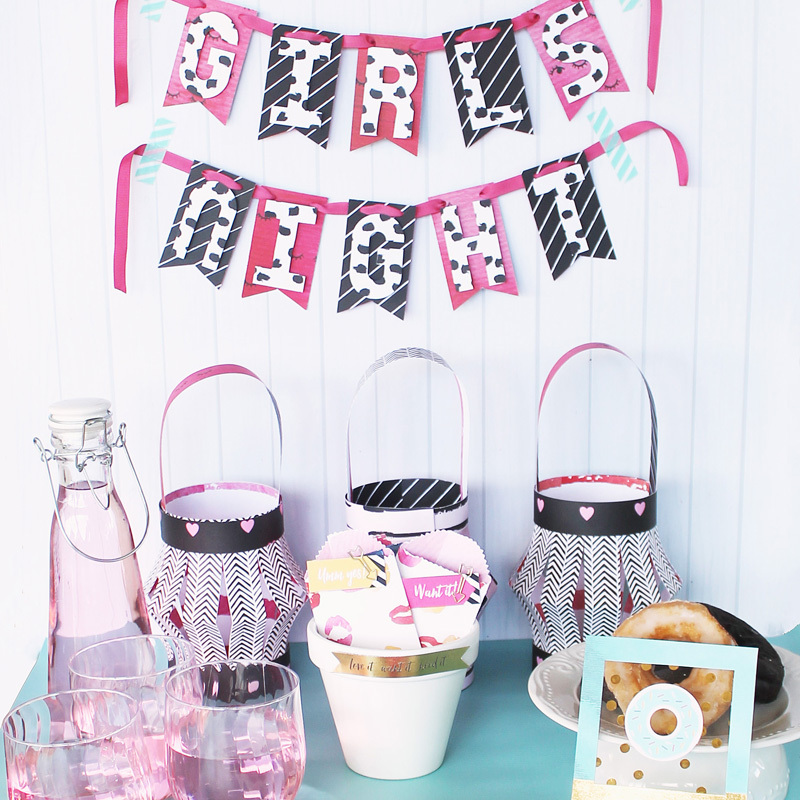 The Urban Chic collection is the perfect set to create party decor to celebrate a girls night. 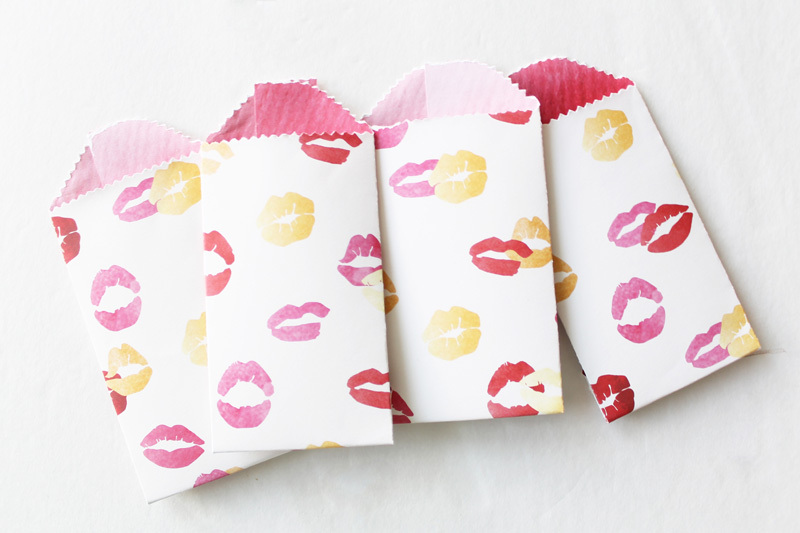 To start with I wanted to create some goodie bags for each girl to take home a little treat. Who doesn’t love chocolate? I used the Goodie Bag Guide on the smallest size with the paper trimmed to six inches wide. I used paper from the Urban Chic collection and was able to create four small bags out of one 12 x 12 sheet of paper. 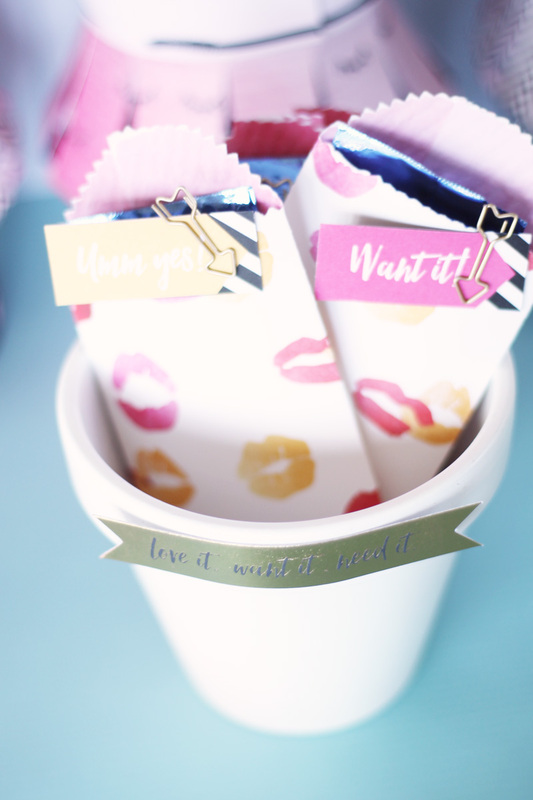 I assembled the bags, added a little treat inside, and then added a little flag I cut out from one of the patterned papers and attached it with a fun arrow paper clip from the Oh Goodie collection. 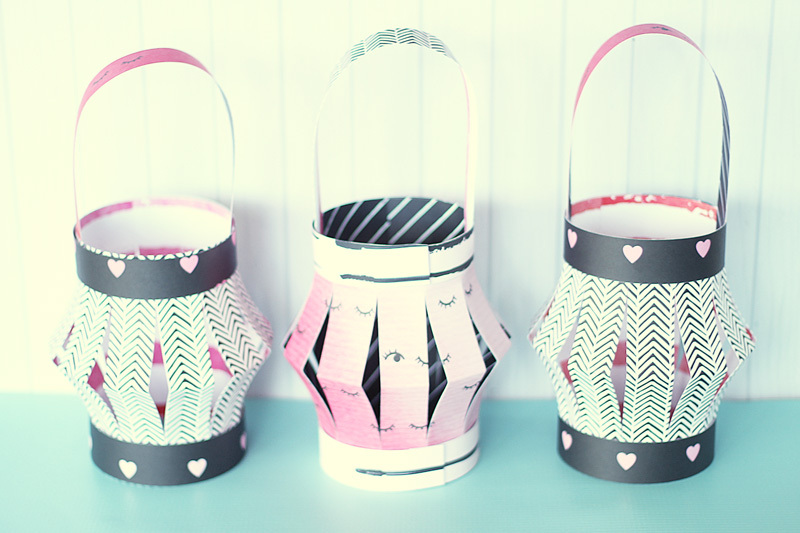 I created some paper lanterns using the DIY Party Fringe and Score Board. I trimmed the paper to six inches tall, and created the paper lantern. I added a coordinating strip of patterned paper around the top and bottom, as well as a little handle. I think all celebrations deserve a banner. With the banner punch board, you can create banners in a flash. 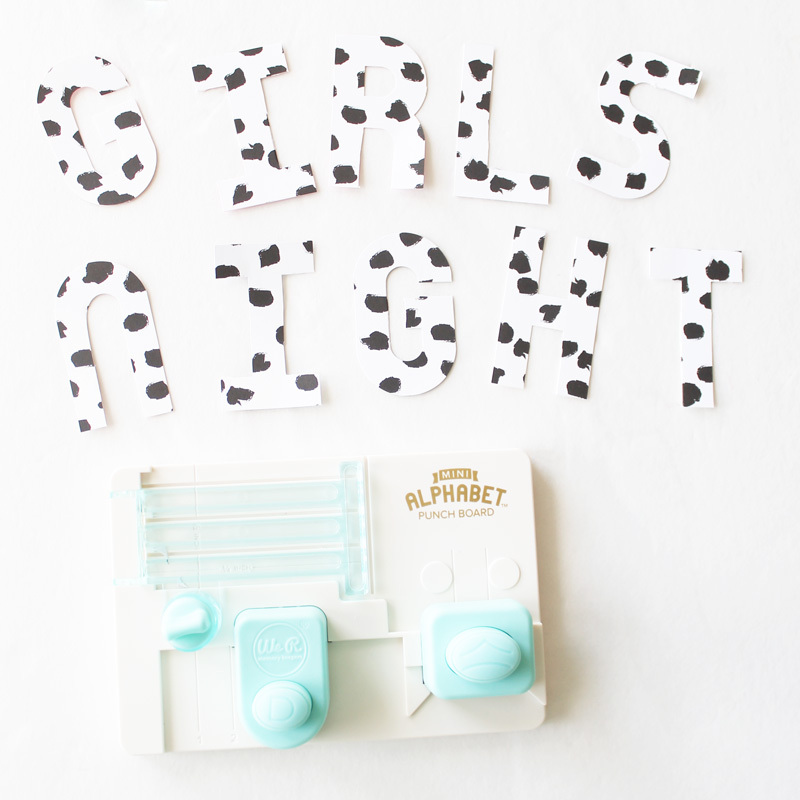 I started by using the mini alphabet punch board to spell out the words ‘girls night’. 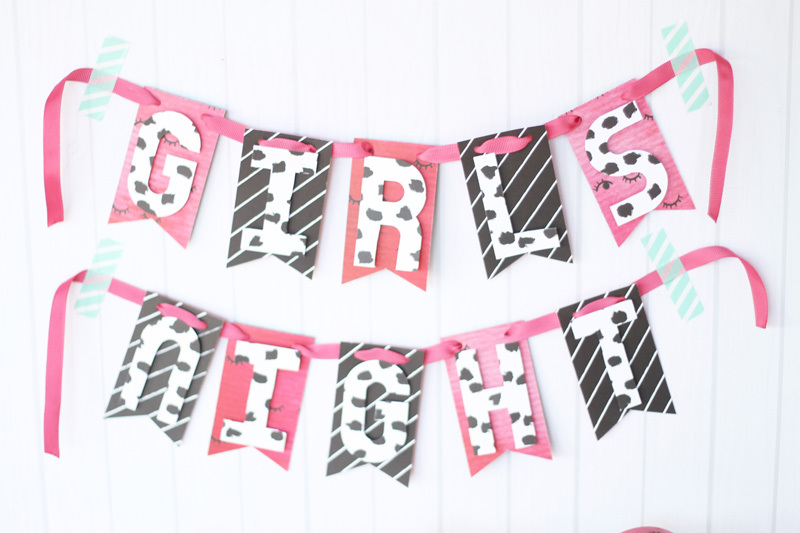 The mini letters are perfect if you are creating a smaller sized banner. I then made little banner shapes using a black and white striped paper. On the back were the cutest little closed eyelashes, so I decided to alternate between both sides of the paper. I used a pink ribbon to coordinate with the paper to string the banner together. I added the alphabet letters with foam adhesive squares. I hung up the banner using washi tape. I set the little lanterns on the table, but you could also hang them up. 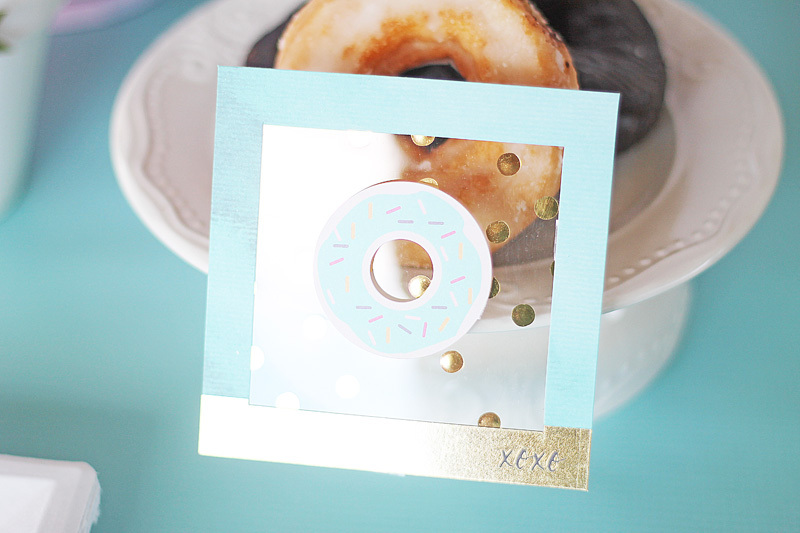 I even created a fun little donut sign using some of the Urban Chic ephemera and an acetate sheet from the Clearly Posh collection. 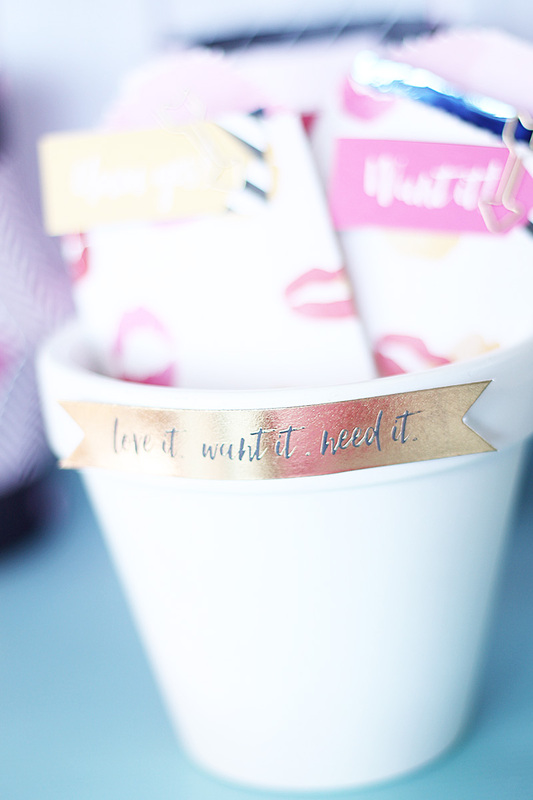 I added the treat bags to a plain white pot and added a fun gold saying from the Urban Chic ephemera collection. The Urban Chic collection is so great for any kind of girls function – a girls night in, book club, or even a slumber party! Happy Monday friends! Let’s get this week started off right with a giveaway, shall we? We’re giving away our new Urban Chic collection to one random winner to kick off Urban Chic Week! Each day this week our team will be sharing a project featuring this exciting new collection, and we want to share the excitement with you! If you’d like to be considered for this giveaway, please leave a comment below telling us what type of projects you would make with this collection. Comments will remain open until Thursday, 8/25 at midnight. A random winner will be announced on Friday morning, 8/26. Please check back to see if you won. Good luck! Happy Friday friends! Today we’ve got some more Typecast inspiration for you featuring the new typewriter and paper collection from our fabulous in-house design team. 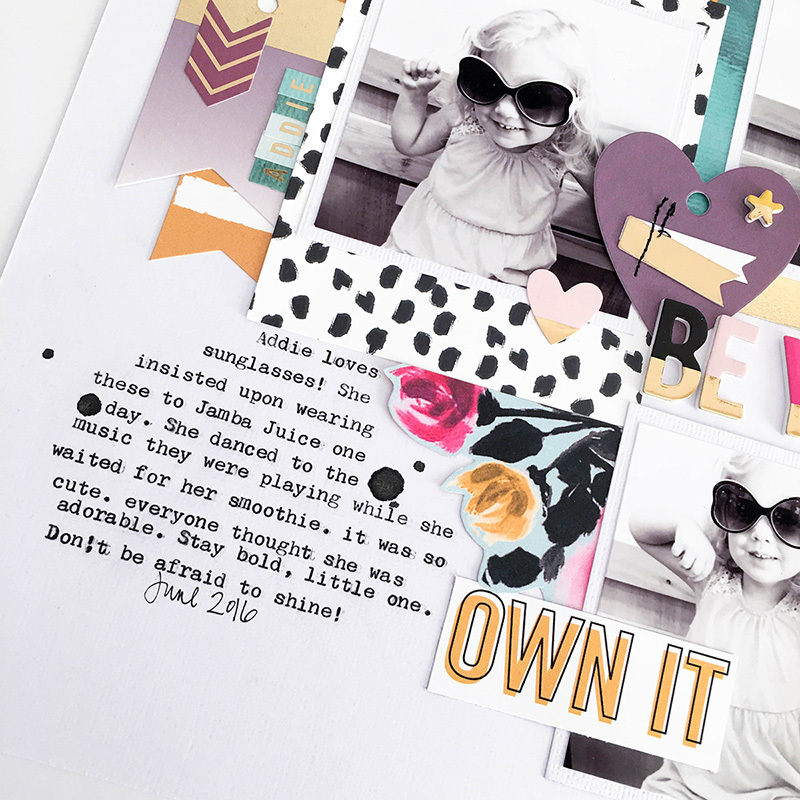 The Typecast makes scrapbook journaling so much easier. Did you know that the Typecast can fit a 12×12 sheet of paper? 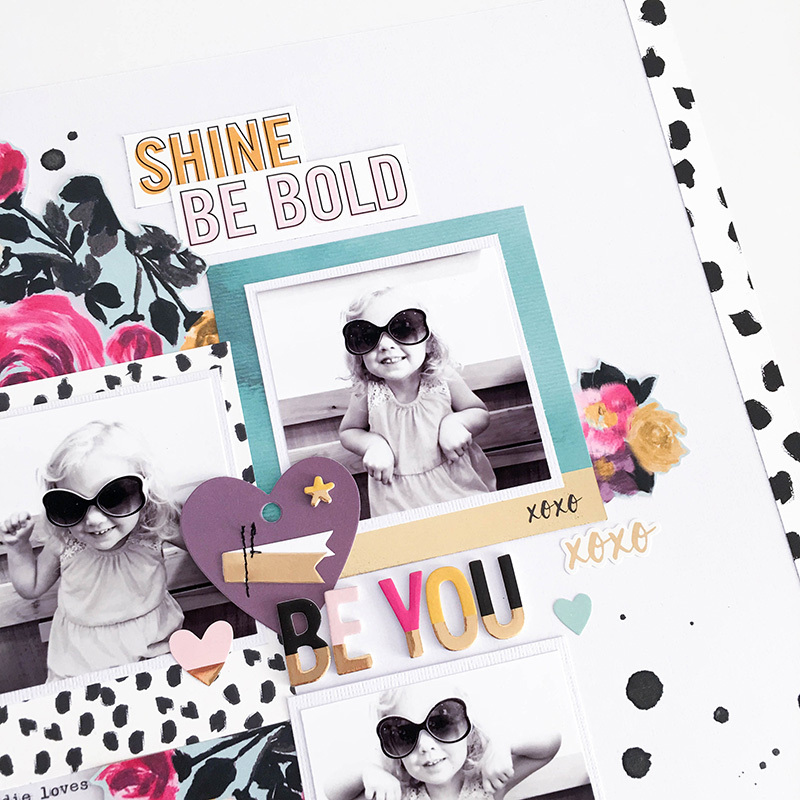 That means you can add typed journaling directly to your scrapbook pages! No more measuring text boxes, printing them, trimming them, and adhering them to your pages. 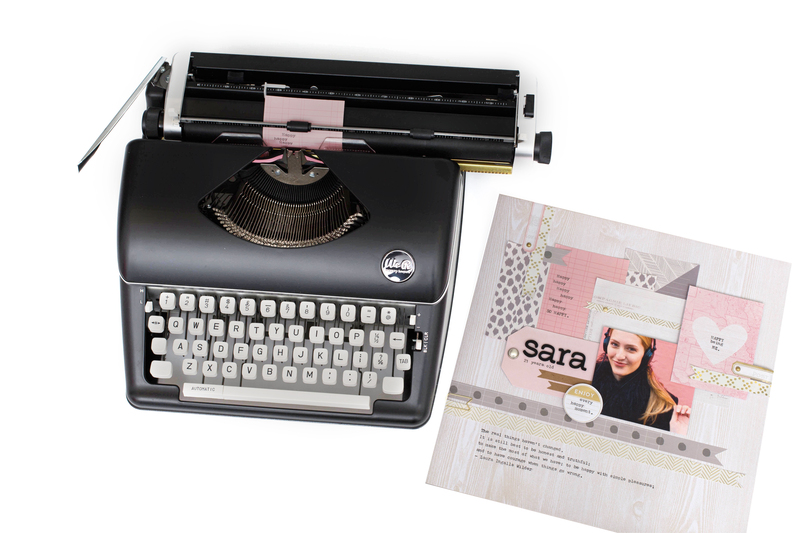 You can also easily add typewriting to your journaling cards and tags. Awesome! Type quote on woodgrain patterned paper 9 ½” from top. Cut a ½” x 11 ½” strip and a ¼” x 4” strip of gold foil cross hatch paper. Snip one end of each to dovetail. 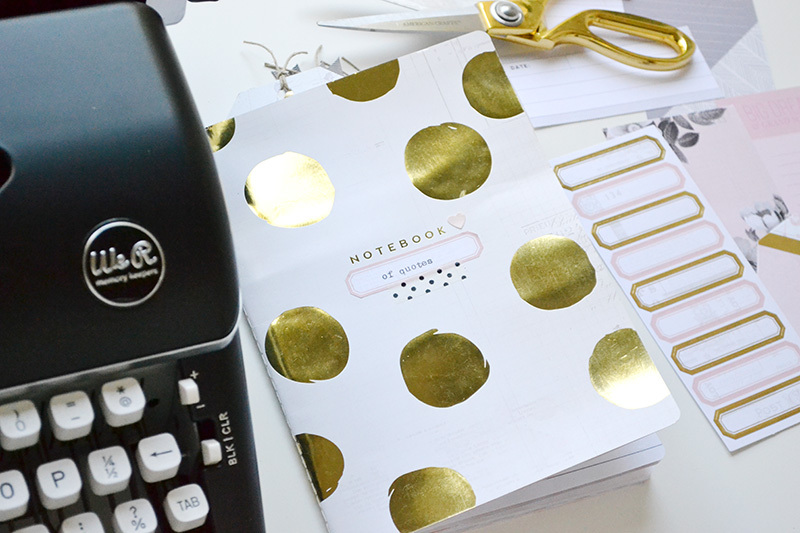 Cut a ¾” x 10 ¾” strip and a 1 ¼” x ¾” strip of gray polka dot paper. Snip one end of each to dovetail. 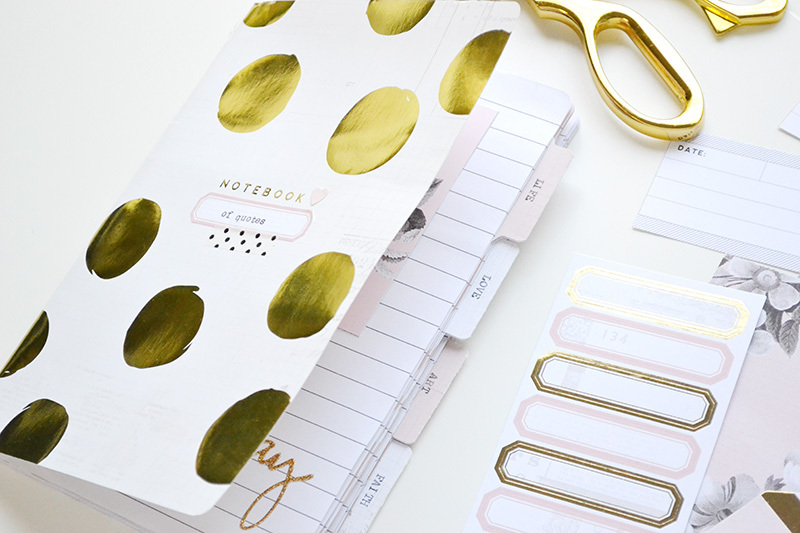 Cut a ½” x 3 ¼” strip and a ½” x 4” strip of gold foil dot paper. Snip one end of each to dovetail. Trim cut apart patterned paper into individual pieces. Type “Happy” repeatedly down left side of pink lined piece. Type “Happy being ME” in center of heart piece. Print a 3 ½” x 4” photo. 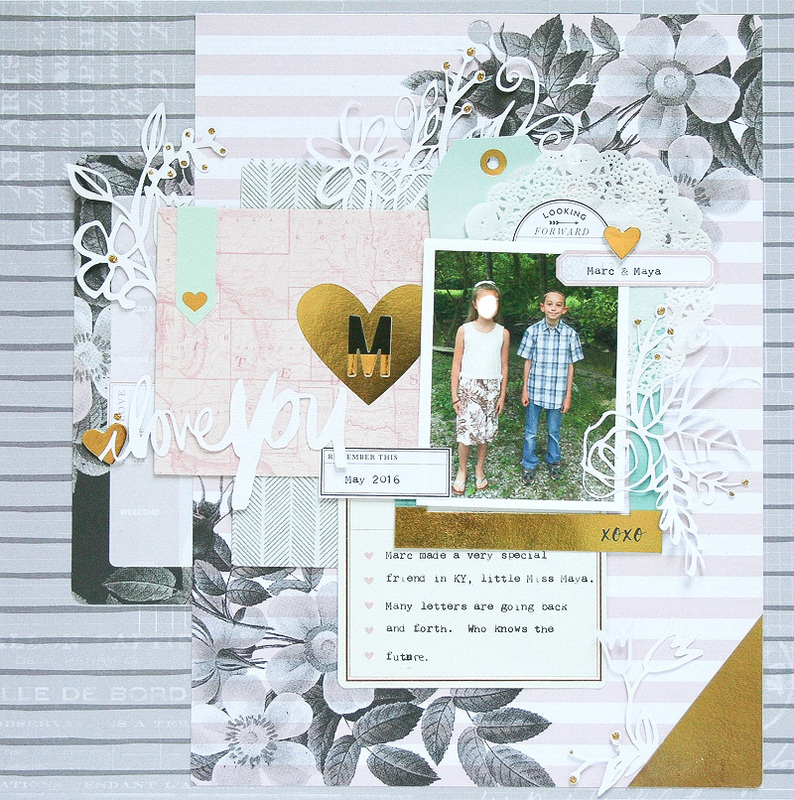 Layer and adhere cut pieces, strips, and photo to woodgrain layout base. Attach brads and gold clip. 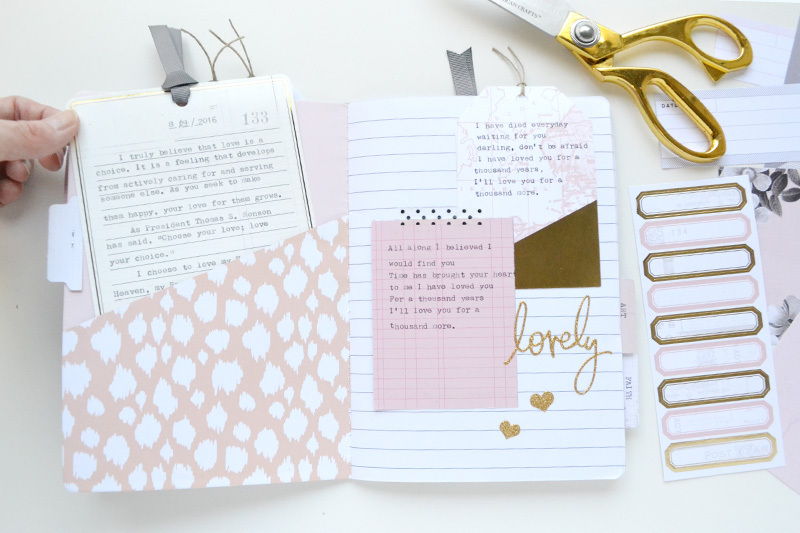 Type journaling on pink tag. Apply kraft tags to pink tag. Apply Thickers to tag. Attach pearl brad. Tuck tag under photo and adhere to layout. Type “every happy moment” on treat bag label. Attach to layout with adhesive foam. Have a great weekend friends, and be sure to check out the Typecast typewriter and collection and your local Michael’s store!